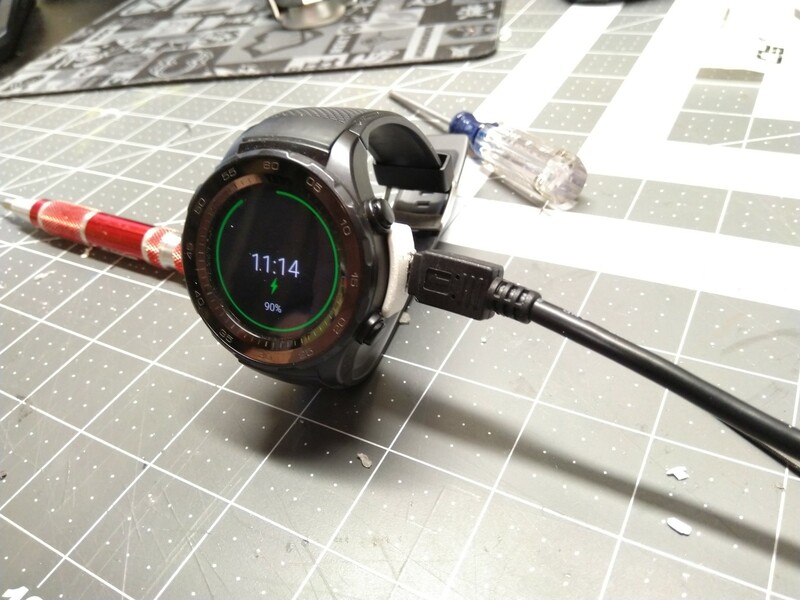 For the life of me, I can’t figure out why smart watch makers insist on bundling giant chargers with their devices. Motorola is probably the worst and was the first travel charger I made, and while Huawei isn’t as large, they attach a 3 foot long USB cable to their chargers. For another project I had purchased a bunch of these USB Micro connectors. They are two part, a plastic sleeve and the connector itself, and pretty easy to hand solder if you have a fine tipped iron. The charge base fortunately has a ton of room inside of it and readily accepted the connector with just a little bit of filing. A micro USB plug actually has 5 wires instead of the usual 4. Ground, Mode Select, D+, D- and 5v. Mode Select is used to determine is a device is going to be a master like in USB OTG or a slave as is more typical. For my use, I just left mode select disconnected and wired up the other 4 pins. The wires on this adapter are really, really crappy and would break almost as soon as I touched them, so it took a few tries. But, once it was all sorted I gave it a quick check with a multimeter to make sure I hadn’t flipped any wires and it worked on the first try. It might not seem like much of a space savings, but when you travel a lot you learn that every cable counts.